The entrance to Cuvaison’s tasting room is across the road from the parking lot of Domaine Carneros, so we have driven past it on many occasions. On this trip, however, we turned left and not right to sample the wines from Cuvaison. 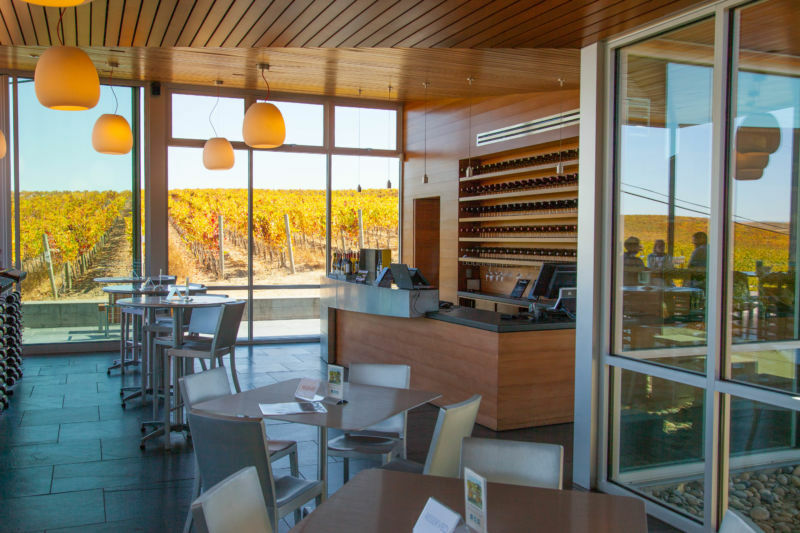 The tasting room is a modern building in the middle of their Carneros estate. Large plate-glass windows offer a stunning view of their Pinot Noir and Chardonnay grapes and a pond that is surrounded by vines. You can taste in the main room, on the terrace, or, as we did, in the gallery. 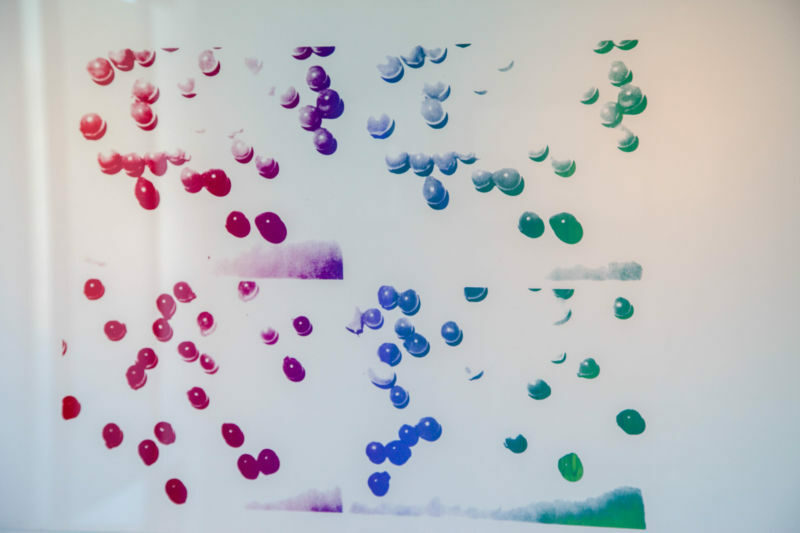 The gallery offers not just the views of the vineyard, but artwork from Andy Warhol. The gallery has modern, dark grey sofas, which fit well with the lighter shade on the walls and the grape related art. The main room has windows on two sides, giving it a wonderful light and airy atmosphere. You might wonder why the vineyard has Andy Warhol pictures on the wall. 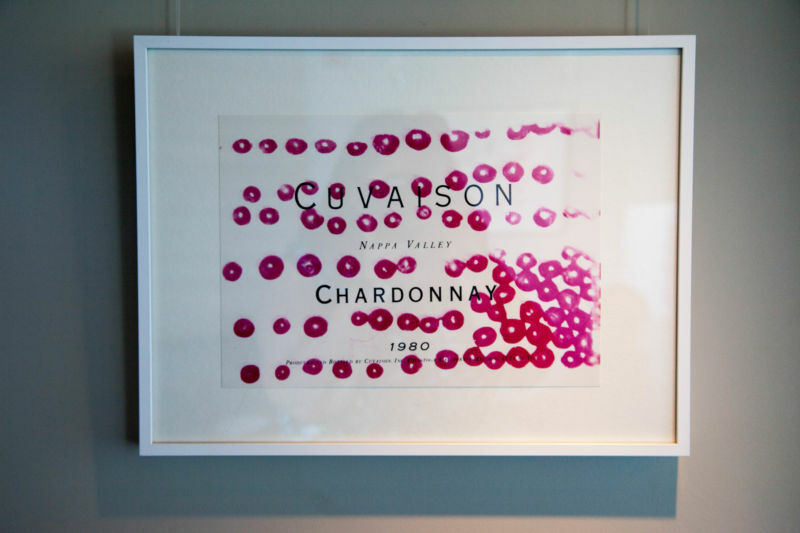 In the early eighties, Andy Warhol was dining with the owner of Cuvaison who showed him a bottle of wine from his vineyard. Andy’s response was that the label was lousy. 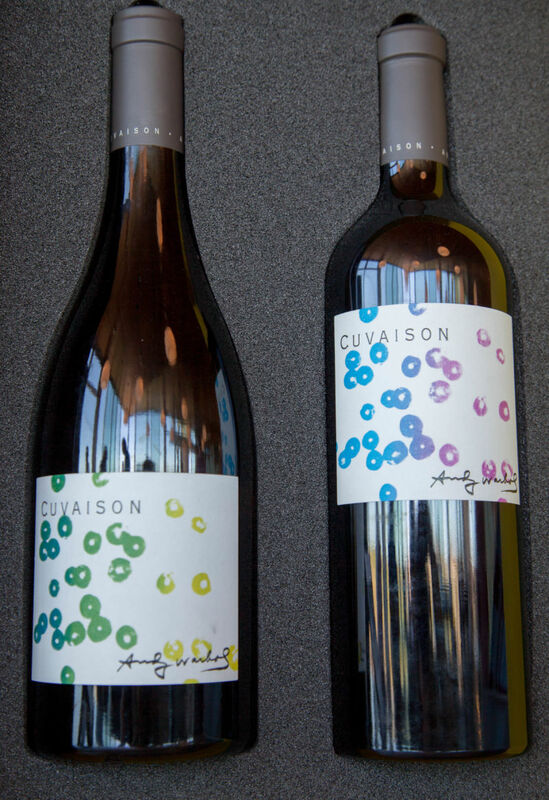 He was commissioned to create labels for Cuvaison. Andy Warhol took pictures of grapes with a Polaroid camera to create a set of unique wine-labels. It is only now that the vineyard is using them, with a limited release of bottles over the next few years. Our host, Paul, showed knowledge and enthusiasm as he took as through a tasting of six wines that showcased Cuvaison’s range. Cuvaison has two vineyards, the one we visited provides Pinot Noir and Chardonnay. The second vineyard is on Mount Vedeer and specialises in Cabernet Sauvignon. As Paul described it one of the vineyards showcases wine in the Burgundian style, the other Bordeaux style wines. 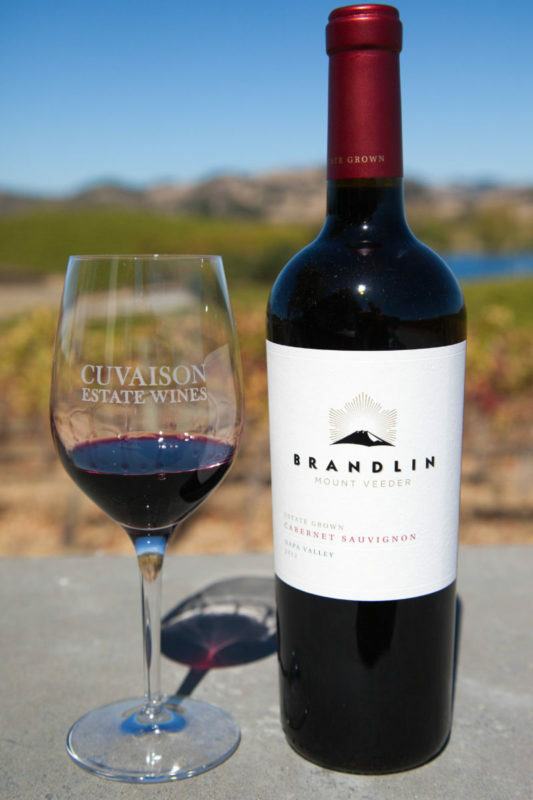 The Cuvaison winery was founded in 1969 and purchased by the Schmidheiny family, who still own it, ten years later. The Mount Vedeer property was acquired from the Brandlin family in 1989. The Brandlin name is still used for wines made from this vineyard. We tasted two Chardonnays; one a blend of grapes from the estate, the other with grapes from a single block. Then we had two Pinot Noir; again with one estate and one single block wine. The final wines were from their Mount Veder property; a Cabernet Sauvignon and a Malbec. The latter being a wine that they do not usually make, but did in 2013 because of what they considered to be an especially fine crop. Paul described the first Chardonnay as acidic and refreshing. The wine had a very pale colour in the glass. When I sipped it, a strong acidity was the first impression, followed by honeydew melon, lemon, and a hint of pepper. 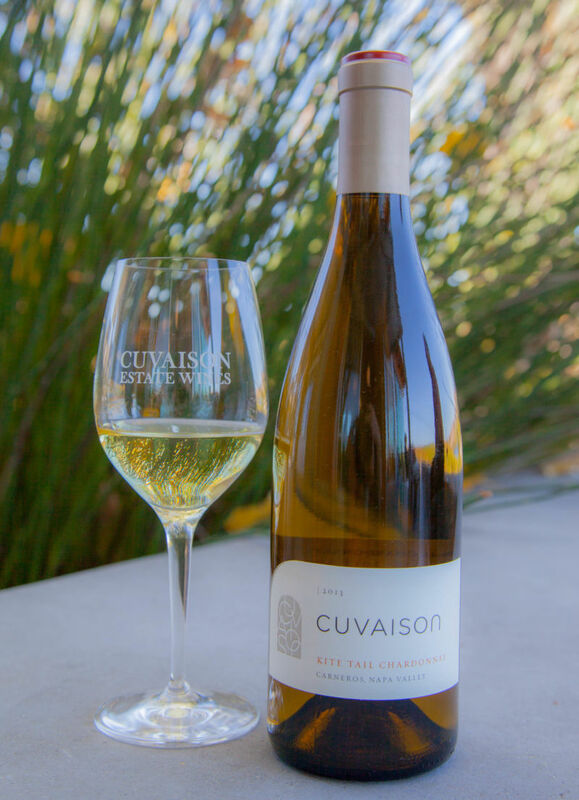 It is worth noting that unlike all too many tasting rooms, Cuvaison did not serve their white wine over-chilled. This was the 2013 estate grown Chardonnay which is sold at the vineyard for $26. The second Chardonnay was a 2013 “Kite Tail” single-block that sells for $49. Compared to the estate Chardonnay this wine spent twice as long in French oak barrels with twice as much new oak. The wine underwent 100% malolactic fermentation. The wine had a more intense yellow colour than the first white. The nose was a rich mix of honey and vanilla. The acidity was low to medium. The oak was in no way overpowering and was well-balanced with cream, melon, and lime. This was a delightful Chardonnay that would pair well with strongly flavoured fish, or chicken in a rich sauce. The Estate Pinot Noir is the second highest production of the wines from Cuvaison, behind the Chardonnay. We tasted the 2014 vintage which sells for $39. The nose was a mix of raspberry, cherry, damp forest floor, and a hint of vinegar. The medium acidity gave way to a long finish of tobacco, black tea, and raspberry. Our next taste was from the 2014 “Spire” single block Pinot Noir, which sells for $52. The tasting room sits right in the middle of the “Spire” block. The Pinot grapes had already been harvested and the irrigation turned off, so the leaves were turning to rich autumnal colours, in sharp contrast to the yet to be harvested Chardonnay whose leaves were still a lush green. The intense and very appealing nose on this wine was of blackberry and odours of a warm wooden deck. California Girl described this latter component as a mix of maple and cedar. The wine offered a long finish of plum and raspberry. This was one of the best Pinot Noir I have tasted this year and is reason enough to visit Cuvaison. We then moved to the wines from their Mount Vedeer Estate. The 2012 Cabernet Sauvignon sells for $68. It is 77% Cabernet Sauvignon with the rest consisting of the traditional Bordeaux grapes, with the noteworthy omission of Merlot. The colour of the wine was a dark purple. The nose was subtle, surprisingly so, for a Cab; offering cherry and cocoa. There was high acidity and tannins; although the latter did not overpower the dark berry flavours. I found this wine underwhelming, especially compared to the other wines we tasted at Cuvaison. The final wine was not part of their standard tasting; the 2013 Malbec. The nose, in sharp contrast to the Cab, was a rich mix of berries, with raspberry to the fore. The taste was an initial blend of blackcurrant and pepper which left a long, lingering, luscious, finish. This was a remarkable wine and well worth the $40 asking price. 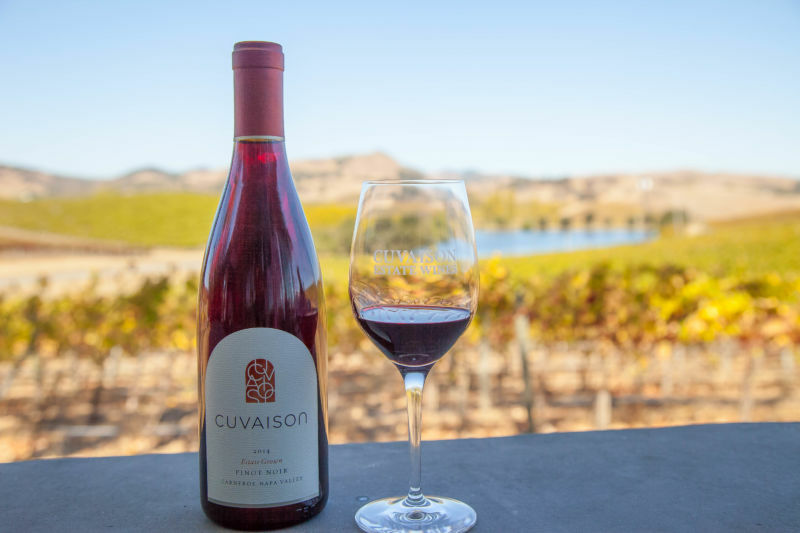 In summary Cuvaison offers a beautiful location, an attractive tasting room, friendly staff, and a range of wines that showcase the differences between Carneros and mountain grown grapes from further North in Napa Valley. The tasting is $25. Reservations are required. 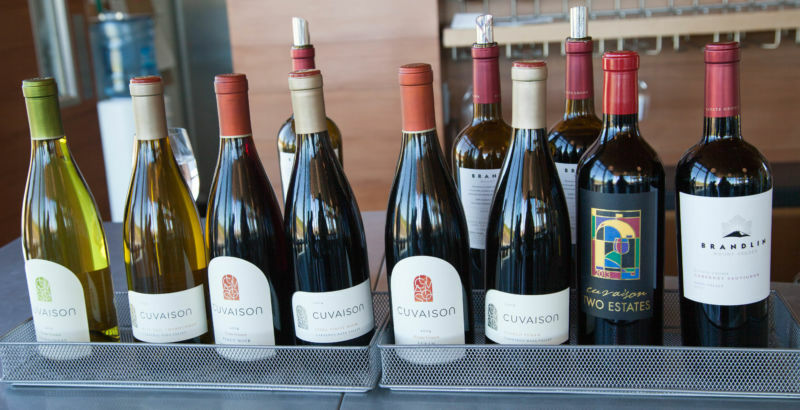 The Cuvaison wine-club ships a three-bottle selection five times a year. You can specify a white-only, a red-only, Mount Veeder only, or a mixed selection.